THERE IS NOTHING MORE CENTRAL THAN LIVING IN AN APARTMENT IN MELBOURNE CBD WITH A COLLINS STREET ADDRESS IN THE HEART OF HUSTLE AND BUSTLE OF MELBOURNE CITY. 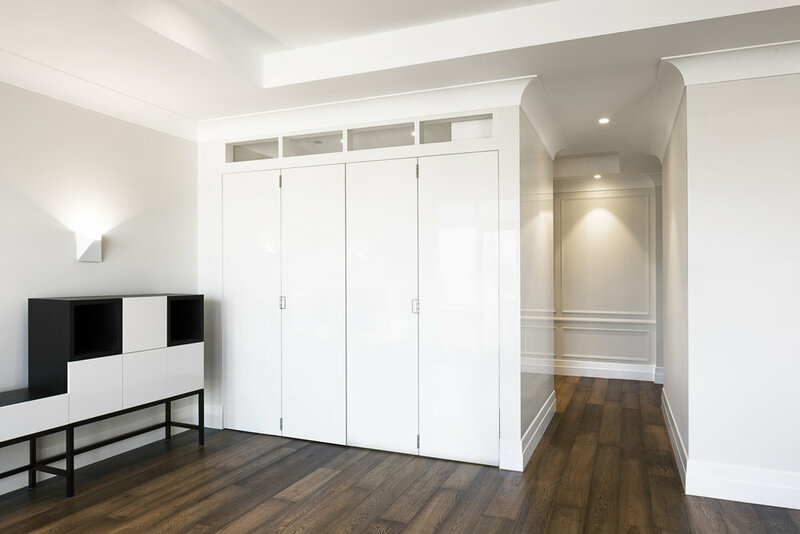 THE EXISTING APARTMENT BUILDING WAS BUILT AROUND THE YEAR 2000 AND AFTER 17 YEARS, OUR CLIENTS COMMISSIONED US TO DO A FACE LIFT TO THE INTERIOR OF THEIR GENEROUS SIZED 2-BEDROOM APARTMENT OVERLOOKING MELBOURNE’S ICONIC LANDMARK; THE SHRINE OF REMEMBRANCE. THE EXISTING FOYER WAS ALSO USED AS A STUDY AREA AS THERE WAS A LARGE DESK AND A CHAIR PLACED IN FRONT OF THE EXISTING FLOOR TO CEILING BUILT-IN JOINERY UNIT WITH ENTRYWAYS ON BOTH SIDES WHICH LED INTO THE OPEN PLAN LIVING AREA. IT FELT AS YOU WERE ARRIVING AT SOME KIND OF A COSMETIC CLINIC RECEPTION AREA. THE WHOLE ENTIRE FLOOR WAS COVERED WITH CREAM COLOURED VERY PLUSH CUT PILE CARPET APART FROM THE WET AREAS INCLUDING THE KITCHEN WHICH WAS FINISHED WITH A HARD WOOD FLOORING MATERIAL. THE BRIEF TO US WAS UNCOMPLICATED AS THEY WANTED TO HAVE THE INTERIOR OF THE APARTMENT REFRESHED WITH A MORE CONTEMPORARY APPROACH, RATHER THAN WHEN IT WAS DESIGNED ABOUT 20 YEARS AGO WITH A LOT OF CREAM PALETTE, PROFILED JOINERY FRONTS AND MARBLE TILES. OUR CONCEPT DESIGN TO THE FOYER WAS QUITE SIMPLE, BASICALLY WE NEEDED TO SEPARATE STUDY FROM THE FOYER BY CREATING A STUDY NOOK, SO WE TOOK THE SPACE FROM THE EXISTING FLOOR TO CEILING JOINERY UNIT INCLUDING ONE OF THE ENTRYWAYS. THE OUTSIDE WALLS OF THE NEW STUDY AREA WERE FINISHED IN LACQUER (2PACK) IN GLOSS TO GIVE A SUBTLE LUXURIOUS FEEL TO THE FOYER. THE OPENING TO THE STUDY NOOK IS NOW CONNECTED WITH THE OPEN LIVING-DINING AREA WHICH CAN BE FULLY OPENED IF NEEDED AND WHOEVER IS USING THE STUDY NOOK CAN NOW ENJOY THE NATURAL LIGHT AS WELL AS THE CITY VIEWS. IT WAS QUITE A CHALLENGE FOR US TO REPLACE THE CREAM COLOURED PLUSH CUT PILE CARPET WITH A NEW TIMBER FLOOR MATERIAL AS IT HAD TO GET THE APPROVAL FROM THE BODY CORPORATE AS WELL AS BE COMPLIANT WITH BUILDING REGULATIONS. HOWEVER IN THE END THIS WAS ACHIEVED BY PROVIDING A THICKER ACOUSTIC FLOOR MATTING MATERIAL. THE OTHER CHALLENGE FOR US WAS TO RENOVATE ONLY HALF OF THE EXISTING EN-SUITE IN THE MASTER BEDROOM. THE CLIENTS STILL WANTED A BATH BUT NOT A SPA BATH AND THEY ALSO WANTED US TO REMOVE MOST OF THE EXISTING SHOWER FIXTURES SUCH AS 3 SHOWER SPRAYS ON EACH SIDE WALL AND A HAND HELD SHOWER AND A SHOWER ROSE ON AN ARM. 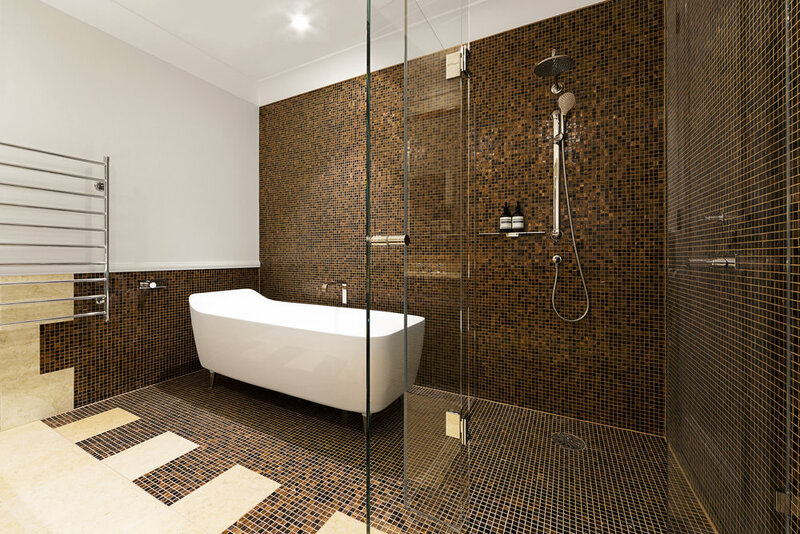 THE CHALLENGES KEPT COMING AS WE HAD TO RENOVATE ONLY HALF OF THE EN-SUITE FLOOR AND IT WAS IMPOSSIBLE TO FIND MATCHING MARBLE TILES. ONCE AGAIN, WE MANAGED TO FIND A SOLUTION FOR THE TILES. WE DIDN’T TRY TO MATCH THE NEW FLOOR TILES WITH THE EXISTING ONES, IN FACT IT WAS THE OPPOSITE. THE NEW BISAZZA MOSAICS WERE INTRODUCED TO COMPLIMENT THE EXISTING MARBLE TILES WITH A “TOOTHING” PATTERN TO BLEND THE NEW AND THE EXISTING. 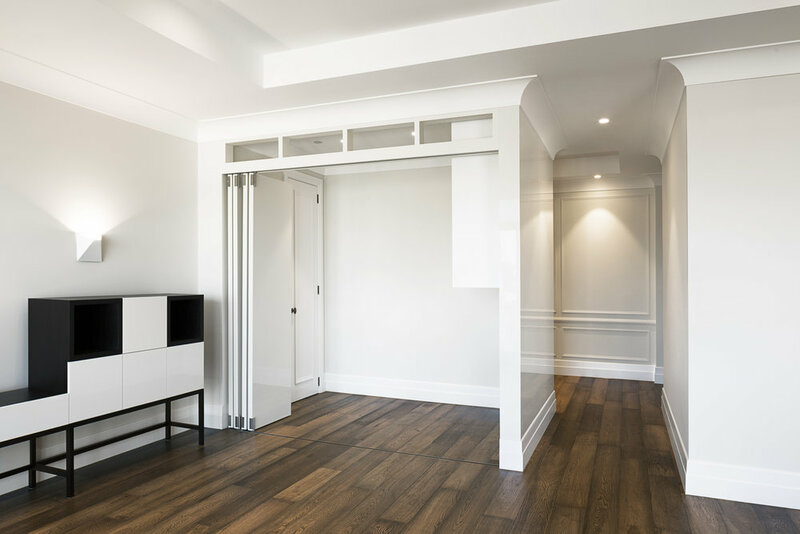 IN THE END, WE HAVE CREATED A CONTEMPORARY LOOK AS OUR CLIENTS HAD REQUESTED AND ALSO ADDED AN EXTRA ROOM WITHOUT RECONFIGURING THE EXISTING ROOMS AND THE INTERNAL WALLS IN THE APARTMENT.